The Arc of Alachua County, Inc. provides equal employment opportunities (EEO) to all employees and applicants for employment without regard to race, color, religion, gender, sexual orientation, gender identity or expression, national origin, age, disability, genetic information, marital status, amnesty, or status as a covered veteran in accordance with applicable federal, state and local laws. Are you looking for a career opportunity where you can use your skills to make a difference in the lives of others? Then The Arc of Alachua County may be just the place for you! We have part-time and full-time direct care positions available. Within our Residential programs, we provide services 24 hours a day. Therefore, we have many shifts available. To learn more about the services we provide, visit our About/History page. 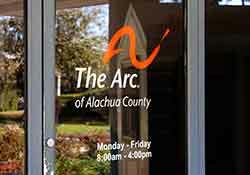 It will give you a quick glance at what our mission is and what we do at The Arc of Alachua County. Applications must be completed online. To view our current available positions and/or apply, navigate to our Job Board by clicking the Application Portal link in the section on the right side of this page. Be sure to answer all questions and complete all the steps within the Job Board application process. * Note: Candidates do not need to upload a resume in order to be considered. If you do not have a resume (or do not wish to include one) you will be given options to “skip” that step. Thank you for your interest in employment with The Arc of Alachua County. We look forward to hearing from you!